It was Tuesday. At 11:00am. In my kitchen. I was standing over the sink, lamenting the countless water spots that littered my stainless steel sink. With absolutely no hesitation, I reached under that sink, pulled out my Weiman’s Stainless Steel Cleaner and Polish plus two fresh reusable, recyclable dishrags and began to earnestly polish that puppy. In no time, the sink was more shiny than glitter in the sun. Job finished . . .But then my eyes caught something else . . . those pesky streaks stretched across an otherwise clean and uncluttered countertop. I began to pull out the homemade vinegar/water spray bottle solution and more dishrags, when I just stopped. I just froze. I stood. I stared. And at that moment . . . the light when on and time seemed to be moving backwards. It was as if the bulb not only was turned on, but had somehow maxed out its ability to shed one more ounce of light. There I was, in the kitchen, holding my Weiman’s, at age 61 and 1/2, looking at a glistening kitchen, recognizing that I had successfully and honestly turned into my mother. I was Izzy. It finally happened. Now, don’t get me wrong. I love my mother, God rest her soul. She was everything to me. A great, great mother. A great mother. And I miss her dearly. And Isabelle Washford Greiner spent a large chunk of her life . . . in the kitchen. The kitchen happened to be in the center of my childhood house, and was on the small side. In that crazy tiny kitchen, she cooked up a storm in there, clinking and clambering those pots and pans until she produced a meal. And as the family finished eating, Isabelle would be cleaning that kitchen with the gusto of a race horse in first place headed for the finish line. Tidy in and tidy out, morning, noon, and night, each and every day. And now, I was doing the very same thing, in much the same way, as my mom had long ago done. Holy transformation, Batman! Really – as a youngster, no one accused me of being neat and tidy. In fact, I was just the opposite. My clothes never saw a closet they liked. My bedroom floor was too littered with junk, trash, and other assorted sundries to ever be seen. Pencils, pens, paper, books, dishes, laundry, etc. were piled high. I am sure that even bugs detested the quality of life in my room and scampered away. But, I was one happy camper there. My mother’s kitchen was perfection. My room was beyond a catastrophic failure. And all I could think was . . .What happened to that girl? I looked at my kitchen at that moment and began to think way more deeply than I expected. What happened to that girl who was so sure that she could solve poverty . . . eliminate hunger . . . end war? What happened to that girl who protested for change . . .participated in every sit-in in the near metro vicinity . . . fought for social justice. What happened to that girl who listened to hard rock music full blast, wore clothes that represented the meaning of the 70s, jumped off cliffs, slid down mountains, and in general approached life by taking risks without ever thinking about potential consequences? Never in my wildest dreams in my youth did I ever think I would own a kitchen, let alone have one with granite, stainless steel, hardwood, and recycled crown moulding. I had no idea that I would be married for forty years, have four children, and spend a lifetime working in education. I had no idea that there would be so many twists and turns to my life and that there would be so many choices to make in so such a short amount of time. What happened to this girl was the same thing that happened to my mom. And in growing up, we both learned similar lessons in very different generations. I have learned that world change comes slow. I may want it to be faster than the speed of lightening and more powerful than a locomotive, but it still comes slow. I have learned that fights worth fighting won’t fall off my radar. I’m still out there doing my part for poverty, hunger, and war. I’m just not as dramatic or over-the-top about it. I have learned that there are ways to protest beyond carrying a handprinted sign and marching through the streets, that sometimes what we don’t say or do is much more powerful than too many words and too much action. I have learned to love more than one category of music and one type of apparel. Luke Bryan and flannel shirts are my friends. And finally, I have learned that it is very important for all of us to continue to take risks, every day . . . in every way. Growing up doesn’t mean settling. Not at all. Today, I may be unable to jump off roofs or ride a bike with no hands or backflip off the trampoline into the swimming pool, but I can still be a risk-taker. We can step forward even when it is uncomfortable. We can work for those who can’t work for themselves. We can walk on the edge of life and feel that wind on our backs. And we can spend everyday anxiously anticipating the next adventure that lurks around the corner. My phrase can’t be “What happened to that girl?” It must be “The ride of her life is going to happen to that girl.” Let the crazy fun continue. “Challenge. It’s my word for 2015,” she said. At that moment, for reasons I cannot explain, we knew that the conversation to follow would be memorable. It was just clear that the four of us had moved from frivolous, fun, no-direction chatter to a much higher, sequential, magical plane. We were about to discuss life and its importance. And from my vantage point, we weren’t disappointed with what followed. Her plan was to select one word. Just one word. She would use that one word as a guide, a beacon for her journey from January until December. She offered no additional rules, and asked if we wanted to participate. Just choose one word and keep a steadfast focus on that word until the end of the year. We all nodded in agreement. In less than one week, my three friends had landed on their words: Challenge . . . Change . . . Zen, all intriguing, inspiring, daring, complex choices. But, within the same week, I was still in some type of holding pattern. Wordless. Along with starting off 2015 searching for the right word, it just happened that I had been reading some very interesting writing. A blog, familiar to me in the year past, was detailing circumstances in countries beyond my experiences. The topics varied from post to post with what I identified as a golden thread of humanity holding it all together. I would see the photos and read the words, and quickly my mind was blurring with thoughts. Suddenly, I had a plethora of potential 2015 word possibilities: free, help, center, food, happy, others, world, poverty, irony, give, get, lost, woman. The more I read, the more words floated to the top. Now, my problem was no longer a lack of words; it was finding and selecting the right word from the crowded list. Hmmm . . . what to do . . . . Though my friend provided no particular rules, by default there seems to be a couple. First, the one word that I choose must fit all occasions. It must be able to balance between moments of distinct joy and happiness as well as moments of considerable pain and sadness. The word must be able to lead me to new adventures, remind me of the difference between good and evil, give me an anchor when I need it, and allow me to laugh, love, and learn throughout an entire year. It should be bold, blessed, and at times, comical . . . humorous . . . fun. It should have an intent. Even with knowledge and consideration of such rules, the days of 2015 began to pass in rapid succession without me finalizing my pick. I truly was headed towards a million choices and not the selection of one, floundering in a pile of words, until . . . today. In an odd moment early this morning, I found my word. I happened to be walking through a snow-covered field at 7:45am. It was a quiet moment. The snow had settled, the morning had no wind, and the hour was too early for any traffic. The sun was peeking over a ridge of barren trees and a lonely bird swooned overhead. 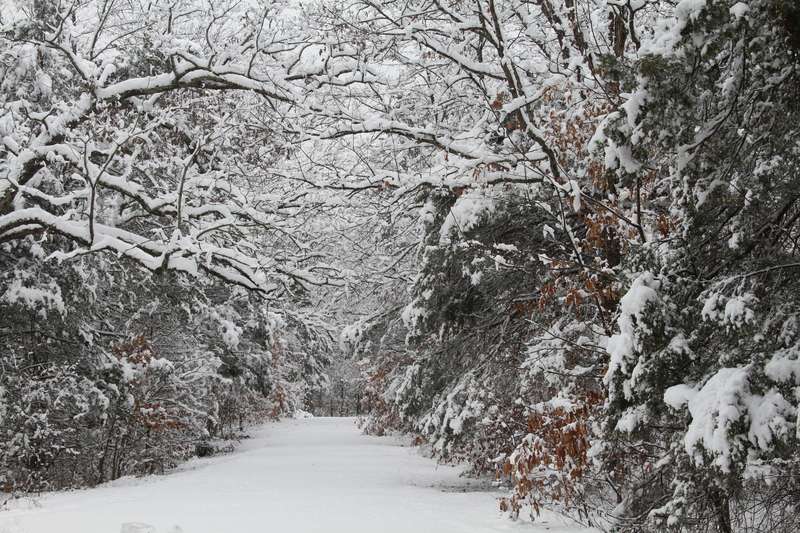 It was a picturesque moment, an outdoor winter splendor. Regardless of the extent of the beauty before me, my attitude was not following in kind. My feet were cold, my shoes were wet. The 6+ inches of snow buried the trail for my walk, and each step felt like I was trudging through cement moments before it solidified. My iPod blared out all the wrong music, but with a temperature below zero, I wasn’t about to remove my gloves to change it. And the struggle in walking through the mounds of snow was causing me to be what I thought was late for my eventual rendezvous with my family – who were all comfortably inside about two miles away. In that moment, at that time, just as my frustrations were nearly getting the best of me, it happened. After nearly fifty days and after some interesting thinking on my part, I found that one word that I could hang my hat on for the rest of 2015. As a matter of course, the one word is actually two, but its essence fits the bill. So for 2015, I am going with crazy-funny. For good or for bad, I have a tendency towards the serious side of things. No doubt, I often see the world as having many challenges and problems. And I know, deep in my heart, that I must do all I can to help solve and resolve issues that press at all humans. I must focus on the greater good at all times, lending all of my talents and treasures to such. It is easy to know that I all should do so. But it is difficult to follow through with that focus for all of us. – always. That’s where my word crazy-funny works for me. As I seek the greater good, I can see that it is important to laugh – laugh at myself, at life, at the crazy-funny situations that happen each moment. This morning, I had chosen to walk to my destination through that snow-covered field. I should have known that the entire experience was going to be nothing more than a crazy-funny circumstance and have expected nothing more. Once I started to laugh at the strange pickle I was in, (wading through piles of snow with an attitude that was creating a huge weight around my neck), my trek became my pleasure. It was a classic crazy-funny moment. It just depended on how I looked at it. Seeing it as crazy-funny made it so. Still the same amount of snow, still the same distance, still the same challenges with walking, but it was all different because of the way I interpreted it. I am hoping that my word choice will allow me – and force me – to look at my 2015 with a truly different vision. Here’s hoping that I can hold onto the crazy-funny year ahead of me! The view was nothing shy of spectacular. And it was certainly not what I had expected to see. I stood quietly with my companions for what can be described as more than awhile – with only the steady clicks of our cameras interrupting the silence. The day was ending with evening approaching much more quickly than any of us desired. Soon our tour would be over, and the six of us would be headed back from whence we came. Thankfully, from beginning to end, the weather had kindly cooperated, offering us a smattering of sunshine, wind, clouds, and rain. Eighty degrees and balmy would have been ideal, but autumn is a season of surprise when it comes to outdoor conditions, and we were prepared. In the last of the moments, I still had not come to terms with the landscape surrounding me. The cliffs were more than beautiful; the water calmly lapping their edge. A lone bird was swirling back and forth, seeming to have no particular destination. And it was quiet . . . so quiet. I thought I was going to see something quite different. In fact, I was most positive that the experience was going to be one hundred and eight degrees away from what the experience actually was. Part of my quiet was due to my inability to quickly move from my past expectation to my current reality. I knew that to visit this site meant that I would be stepping on ground where many – too many to count – had died before me. I just didn’t know what to expect. World War II started and ended well before I was born with every subsequent generation since June 6th, 1944 having chronicled the horrific battles that transpired on and near Omaha Beach. All six of us had studied the history well in preparation. But, it absolutely did not prepare me. I saw magnificent colors in the water swells. I saw green, moss-covered cliffs with auburn, crimson, and turquoise hues. I saw a blue and white-painted sky with moments of gray pushing towards shore. I saw serenity, peace,and calm. I saw majesty. I listened as our most reverent tour guide spoke about lost lives on Omaha Beach. 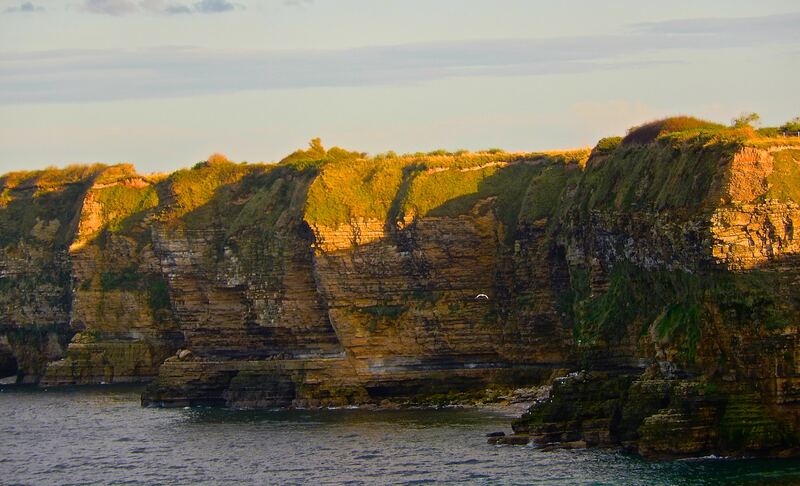 He mentioned those who scaled the cliffs in twenty minutes and survived both the climb as well as enemy fire. And he mentioned those who did not survive. He described the men who exited their boats and headed towards sure-death on the beach. He described the deafening sounds of that day, as all sorts of explosives were launched from sea to shore and shore to sea. The more he spoke, the more I realized that all the ground around me – as well as the tiny piece beneath my feet – held the memory of the death of many. My heart ached – and still does ache – for all of those who died in pursuit of freedom for others including me. Yet, when I looked out towards the horizon, I saw beauty. In fact, the nearby rock formations were mesmerizing. Likewise were the sandy shores and the surrounding vegetation. Here and there were tiny cottages, some vacant, some inhabited, all that clearly had stunning views of the Omaha Beach of today. There were many memorials to those who had fallen in service to their country seventy years earlier, all of which were impeccably landscaped and maintained. A scenic coastline, serpentine road cut through the hillside, bringing visitors like me to see and experience the history of the area. I must admit that I still have not come to terms in any way with Omaha Beach’s unbelievable beauty juxtaposed with the reality of the heightened degree of suffering and death that occurred in the same place. Perhaps the generations that follow me will offer greater clarity and understanding of how we, as humans, can come to some understanding of the balance between nature and history. I know for me it is something that I will ponder for much time to come. For me, it was that incredible memorable family dance moment. The band was playing what could easily be described as the music of many – the type familiar and beloved by both the young and the old, not too loud and not too slow – music for the ages. The reception was in full swing. And at that particular moment, I looked around and noticed it immediately: all of us on the dance floor were related. Brothers, sisters, aunts, uncles, nieces, nephews, sons, daughters, moms, dads, and grandchildren. All of us were happy, laughing, smiling, and . . . dancing. Admittedly, we could have never described the dance we were dancing as organized. It wasn’t refined, or symmetrical. It wasn’t pretty, cultured, or structured. In fact, if analyzed, it was fairly clunky and chunky. No one had rehearsed, and although the family talents are many, there are no professional dancers in the mix. Just a group of folks ranging in age from zero to 80+ who were happy, laughing, smiling, and . . . dancing. And, of course, it wasn’t dancing in the very traditional sense. Rather than pairing up in a Fred Astaire / Ginger Rogers type manner, the dance floor resembled more of a brood, a clutch, a gaggle, or a flock of individuals moving at the same tempo, in the same rhythm, using the same motions, to the same music, dancing that potentially awkward and always interesting family dance. Large gatherings, such as this one happened to be, are not uncommon in my family. With six siblings at the core plus twenty-one immediate cousins, all family gatherings end up on the large to very large size. Birthdays, graduations, holidays, weddings just turn into big, giant family celebrations. Luckily, in my family, each relative not only seems to know every other relative well enough to dance, but all family members seem to understand each other and have an over-arching acceptance of and pride in all kinds of similarities and differences among the group. And with family dancing, it is the differences that can and do shine brightly. At that particular moment, several folks in the teenage set were not only dancing, but singing madly along with the band leader, unabashed and unafraid of displaying their singing (or non-singing) aptitude. One family member, who could normally be described as quiet and pensive, in a very brave move, having been coaxed to the dance floor by the young but married cousins, displayed some serious dance motion which added a new piece of delight throughout all. An uncle was arm in arm with a tiny niece, tapping his foot, simultaneously swinging her in step with the beat of the music, while my sister and I held hands over the backs of our respective spouses with whom we were dancing. 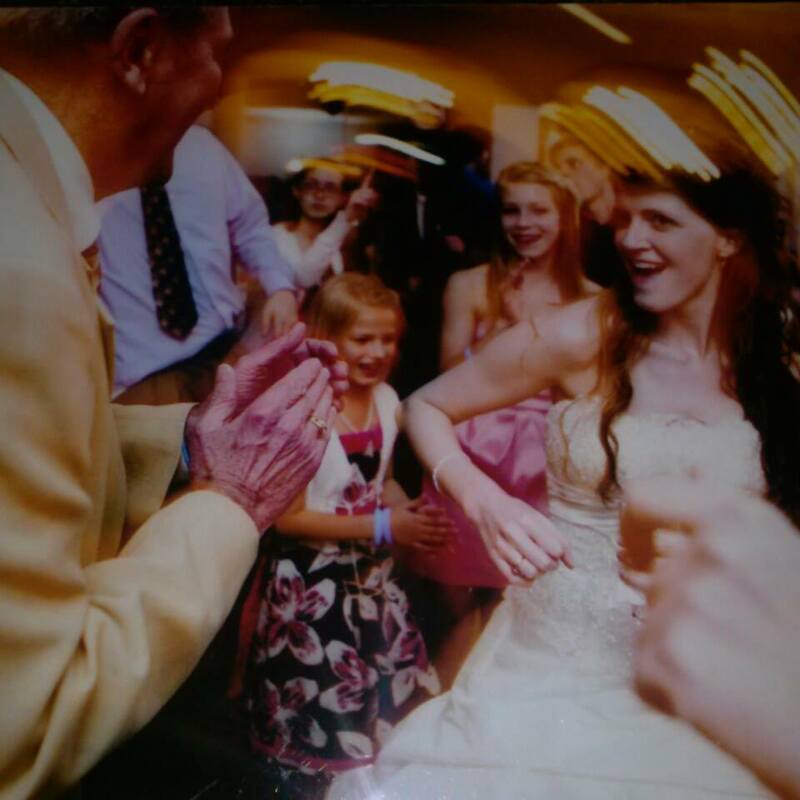 As the music reached a crescendo, with bride and groom center stage – the rest of us broadly encircling them – our pop, a less than spry 80+ year old and only remaining grandparent, decided to join the group. With his walking more of a chore than a pleasure, his participation surprised all of us. We stared as he edged so gently and carefully towards the middle and watched as the wall of his grandchildren and children parted to accommodate and include him. He didn’t know it at the time, nor did we, but he was dancing his final family dance. And it was magical. His dance moves were quaint and soulful. They were deliberate and slow and filled with youthful joy. As he cautiously swayed to the sounds, his family did the same, holding our breath hoping he was successful and hoping the moment wouldn’t end. For as he danced, he exuded an aura that captured a lifetime of happiness in a family dance that he had helped to generate and foster. Without a doubt, it was a family dance for the ages. And though usually during the height of a wedding celebration in the middle of a dance floor surrounded by generations of family, it isn’t the moment to capture a serious life lesson. But, that’s the magic part of it. It was obvious to me that the family dance was not for a moment about music and movement. The band may have played and feet may have shuffled, but it was very incidental to the rhythm of the event. We were throwing away our challenges and our barriers. We were delighting in the common family bonds that we had cultivated for many years, and we were family dancing. I don’t necessarily like the following adage. It seems tired and overused, but it also seems to be true that life isn’t a short sprint, but rather a long, long journey with moments of challenge, of concern, of worry along with moments of joy, hope, and celebration. I journey with many family members with whom I sometimes disagree, often disappoint, and always seem to need more than I have the ability to help. But with enough time and with lots of concerted effort, I am hoping that my journey can include that one last magical moment, that perfect storm, that extraordinary symbiosis, the family dance. I just have to plan ahead and work hard. I say bring it on! “Mom, you go first,” she said with confidence. So I did, and as I looked back at her, I knew times were a-changin’. The weather was beautiful and the snow was perfect. The slopes were glistening and we were skiing together as we had for the past 25+ years. This year’s ski-adventure started out like all those that preceded it. We arrived at the lift-line a few minutes prior to opening. We secured boots, strapped on helmets, slid on gloves, and clicked into our skis. Moments later, we hopped on the first lift and headed up the slopes. Throughout the initial ride, we chatted briefly about our ski-history . . . the times we had been together on this particular lift . . . the weeks we spent as a family skiing . . . all of the traditions of the past. We smiled because here we were doing it again – skiing for a week, and it was only day one. Over those past 25+ years, I have learned that she prefers skiing in wide open spaces, in light fresh powder, the faster – the better. Steep downhills don’t phase her, nor does skiing over ice in cold, cold weather. 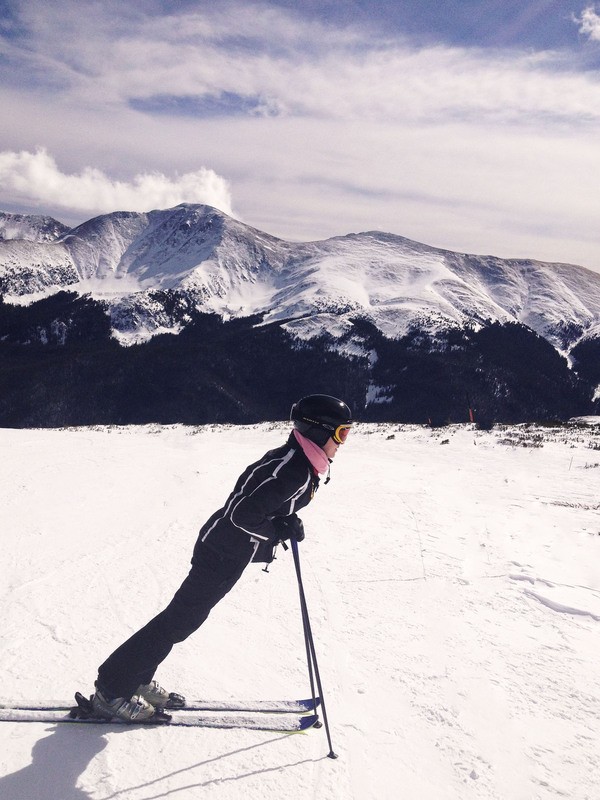 In fact, she is an excellent skier – with the skill and ability to maneuver most any terrain. At the top of the slopes, we plotted out our first runs – something a little easy to start the day. And for the first hour or so, we traveled back through some of our favorite ski-haunts – pushing powder here and there – gliding and sliding – laughing and chatting. Finally, we decided to move on to bigger and better runs – something a little more challenging. With the snow conditions perfect and the sun shining, we opted to head to up to the top – to the summit – to see the sights and ski with gusto. A smooth six-person lift took us up. Once off the lift, we stood in awe of what we could see. We were slightly above the treeline – and the Rockies stretched out in front of us for miles and miles and miles. The slope in front of us was actually a little dicey. Most of the snow at the top had blown off so we were starting out on ice. The second section had been well-skied by others, creating a few navigable moguls. Oddly enough, 500 feet from us, the ski patrol was assisting a young man who looked like he had an unfortunate meeting with a nearby tree. The final section would take us through glades and glades of evergreens until the run flattened out near the bottom. Skiing is an interesting sport. Any great resort will have terrain for everyone – accommodating both beginners and experts and everyone in between. Most runs have an easy way to the bottom and a challenging, more exciting way as well. Skiers judge their own ability and choose their own paths. Throughout our ski history, we have always skied following a simple rule – an unwritten and an unspoken one – but a simple one. The strongest skier goes last. If those in front of the last skier encounter challenges beyond their abilities, that strongest skier is a tremendous asset – having the skills to not only self-navigate, but to help navigate others when necessary. In past years, more often than not, I was the last skier. There were many times when I hauled my children out of ski-misadventures – following them down slopes that were well above their abilities, chasing them down paths through snow-covered trees, fetching runaway skis, and pulling them out of piles of snow after a fall. The last skier. But with those four simple words, I knew that the times were a-changin’. I glanced back and saw her standing, confident and proud. She was perched just a few feet away from me and used her ski pole to casually point towards a solid direction that we should take. I nodded equally as casually and pushed myself slightly over the icy start. The only sound I heard at that point was the swish of my own skis. I knew that she was waiting above me – as I had done for her so many times before – patiently and appropriately, making sure that I wasn’t going to encounter any problem or challenge. It was her turn now and my turn to let her have a turn. Out of the ice, I hit the short section of moguls, and headed for the trees. I stopped for a brief second and heard snow spraying off of her skies when she stopped immediately behind me. Though nothing outwardly had changed – we typically stopped throughout any ski run, just for fun, laughing, resting, smiling – inwardly much had changed. Everything in life has its own season, and though my initial response was to delight in seeing her move into a different one, it was also about delighting in my movement as well. I now had another person in my life who was following and watching over me, someone to follow me through my misadventures and fetch my runaway skis. It was the changing of the guard in a part of my life, and all I could think about was all the crazy-fun that would lie ahead for me and for her. We finished the run with little to no fanfare – which is great when skiing – and hopped right back on the same lift to experience it – one more time, again.